Our MADE IN THE USA, Confederate Battle Nylon flags are accurate reprodutions of the most commonly exhibited American History Flags and comply with the strict specifications. All flags are made of Acid Dye Construction.The best-known of all Confederate flags-the battle flag-is often erroneously confused with the national flag of the Confederacy. The battle flag features the cross of St. Andrew (the apostle was martyred by being crucified on an X-shaped cross), and is commonly called the "Southern Cross." A large degree of the Southern population was of Scottish and Scotch-Irish ancestry, and thus familiar with St. Andrew, the patron saint of Scotland. The stars represented the eleven states actually in the Confederacy, plus Kentucky and Missouri. 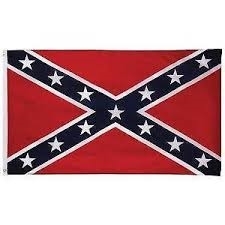 This flag is the flap popularly associated with Robert E. Lee, and is the flag under which he fought. The Army of Northern Virginia was the first to design a flag with the cross of St. Andrew, and Gen. P. G. T. Beauregard proposed adopting a version of it as the standard battle flag of the Confederate army. The Harper's Weekly Image above shows Beauregard's Arkansas troops serving under the "Stars and Bars" flag in 1861. The Army of Northern Virginia can be seen serving under the "Southern Cross" in 1862. One of its virtues was that, unlike the Stars and Bars, the Southern Cross was next to impossible to confuse with the Stars and Stripes in battle. The Confederate battle flag eventually developed wide acceptance 0throughout the Confederacy, but it was by no means the only battle flag.